Assistant aviary manager Bree Dunham with the eaglet. Aviary staff has been working to prepare an American bald eagle hatched at the facility in May for release. In addition to securing permission from the United States Fish and Wildlife Service to release the eagle, the staff prepared the aviary so that it can to come and go from the facility to ensure he’s healthy and that he has the hunting skills to sustain himself in the wild. At sunrise the morning of his examination, staff put on smoke, put down tobacco and prepared to catch the eaglet. Staff proceeded with the exam with the help of Dr. Staci Roberston from Nichols Hills Veterinary Clinic. Within a minute of entering the enclosure, the staff had the eagle in hand and then proceeded with the exam. He received a clean bill of health. The staff plan to “hack” the eaglet from the enclosure. The process is much more natural than releasing the eaglet from the platform. The staff will hold him in the enclosure where he hatched until he can fl y before opening a section of the enclosure so he can come and go while acclimating to his new environment. While fitting him with the telemetry backpack and banding him, another team will make two modifications to his enclosure. First, a section of the slats will be removed to allow the eaglet to come and go, and then new perching will be added on the inside and outside of the enclosure opening. Once completed, he will be returned to his enclosure. The aviary is temporarily closed to visitors to allow the eaglet to become comfortable in his new environment. For more information about CPN eagle Aviary and updates, visit potawatomiheritage.org or facebook.com/CPNeagleaviary. 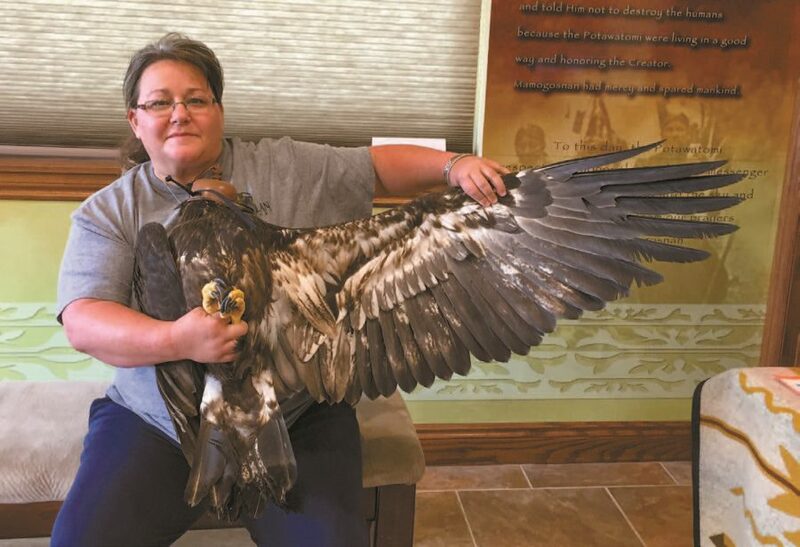 Send your encounters with eagles in Oklahoma, or wherever you may be, to aviary@potawatomi.org.